TrondheimSolistene is regarded one of the top chamber orchestras in the world. Their DIVERTIMENTI was nominated for the 2008 GRAMMY Awards as "Best Small Ensemble", "Best Engineered Album" and "Best Surround Sound Album". Now IN FOLK STYLE sets a new standard for the performance of Edvard Grieg's "Suite From Holberg's Time" with the intense musical details revealed in this most spectacular surround sound recording ever made. Download free iPhone ringtone. Watch YouTube HD video. The Trondheim Soloists (TrondheimSolistene) from Norway are one of the most exciting young ensembles performing on the international stage. With the appointment of the cellist Øyvind Gimse as Artistic Director in 2002, the orchestra is now widely recognised as being at the forefront of defining artistic quality in Norway, collaborating with artists of the highest calibre across a broad range of genres. Øyvind Gimse is assisted IN FOLK STYLE by concertmaster Geir Inge Lotsberg. The Trondheim Soloists are in May and June 2010 touring China, their main concerts to be held at World EXPO 2010 in Shanghai, Chongqing and Beijing. They last visited China on an extensive Far-East tour in 2008, with the world-famous violinist Anne-Sophie Mutter from Germany. For the coming tour, the Trondheim Soloists will perform music by the Norwegian composer Edvard Grieg, Chinese composer Tan Dun as well as traditional Scandinavian folk music. Soloists will be the internationally renowned Norwegian singer Sissel Kyrkjebø and the folk musician Emilia Amper. In addition, the Trondheim Soloists will play concerts in Hangzhou og Sozhou at the opening of exhibitions by one of Norway’s most highly profiled painters, Håkon Gullvåg, with whom the orchestra has had close cooperation. The Trondheim Soloists are also performing at several events for NTNU, Sor-Trondelag County Council and the Norwegian government. 2L is distributed in China and Hong Kong by Naxos International. 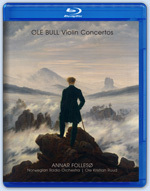 Blu-ray is the first domestic format in history that unites theatre movies and music sound in equally high quality. The musical advantage of Blu-ray is the high resolution for audio, and the convenience for the audience as one single player will handle music, films, their DVD-collection and their old library of traditional CD. What we are seeing is a completely new conception of the musical experience. Recorded music is no longer a matter of a fixed two-dimensional setting, but rather a three-dimensional enveloping situation. Stereo can be described as a flat canvas, while surround sound is a sculpture that you can literally move around and relate to spatially; with surround you can move about in the aural space and choose angles, vantage points and positions. Our Pure Audio Blu-ray Discs has been designed to offer two ways of operation, either with or without a TV screen: you can either navigate the on-screen POP-UP MENU or simply use the dedicated buttons of your remote control. The NUMERIC keys directly access the corresponding track number and the desired audio stream can be selected by the COLOURED keys on your remote. 5.1 DT S HD Master Audio is preselected. These functions are developed by msm-studios and Lindberg Lyd. mShuttle is the key to enjoying your music even when away from your Blu-ray player; Connecting your BD player to your home network will enable you to access portable copies of the songs residing on the disc: you may burn your own copy in CD quality or transfer MP3s of your favourite tracks to your mobile player. mShuttle provides a versatile listening experience of Pure Audio Blu-ray in studio quality FLAC on your home entertainment system, in CD quality in car & kitchen, or as MP3 wherever you are. Make sure that your BD player is connected to your computer network. Put the Pure Audio Blu-ray Disc into your BD player. Open the Internet browser of your computer and type in the IP address of your BD player. You will find this address in the setup menu of your Blu-ray Disc player. 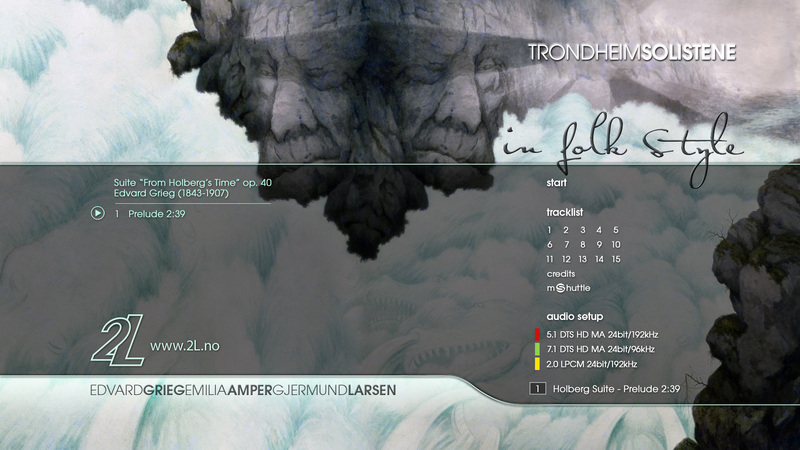 Select booklet and audio files to download from the Blu-ray to your computer. 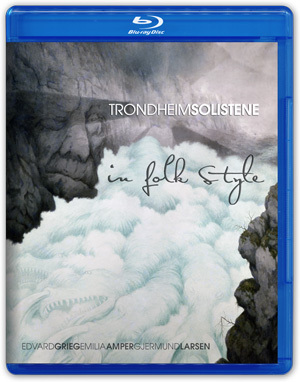 IN FOLK STYLE is produced by Lindberg Lyd and released by 2L, a Grammy nominated record company renowned internationally for its uncompromising focus on audiophile quality. 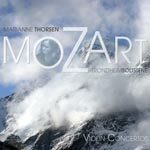 2L has previously released TrondheimSolistene's MOZART (2L-038-SACD) - a disc that was declared a "Record To Die For" by Stereophile magazine and which received a Norwegian recording industry Spellemann prize. 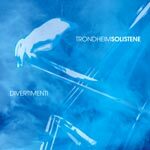 DIVERTIMENTI (2L-050-SABD) was nominated for the 2008 GRAMMY Awards as "Best Small Ensemble", "Best Engineered Album" and "Best Surround Sound Album". 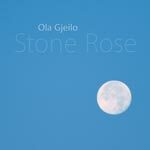 This reflective, tuneful album is a collection of beautiful piano music written and performed by Ola Gjeilo. His music is a blend of jazz, classical and popular music influences, married in a unique and passionate style. The evocative melodies and harmonies are sure to captivate listeners from the first hearing. Many of the tracks are expressions of Ola's deep love for New York City, where he lives and maintains his highly successful career as a composer and pianist. Also featured on the album are elite American and Norwegian musicians Johannes Martens (cello), Tom Barber (flugelhorn) and David Coucheron (violin). SA-CD.net: "Outstanding entertainment, brilliant playing and immersive sonics. Highly recommended."